Eric Payne, Maryland, with his 73 7/8" moose. 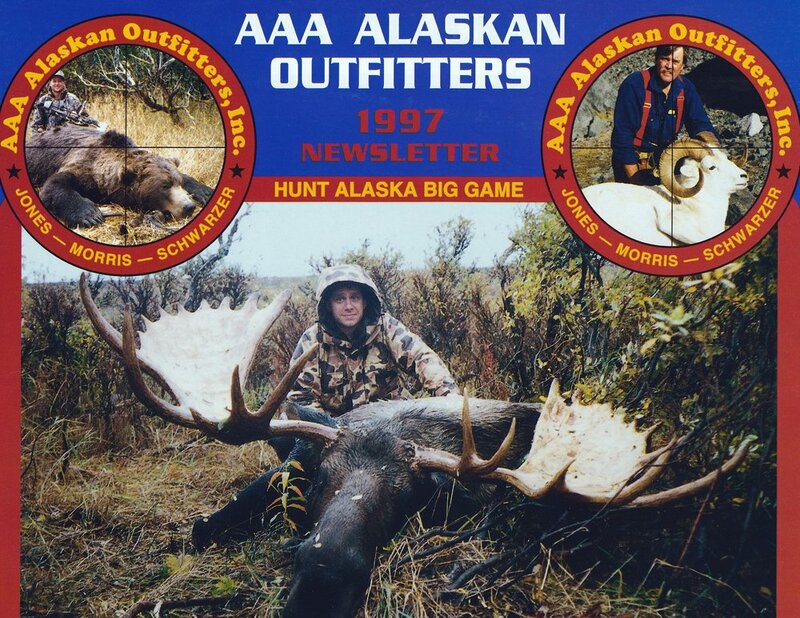 This was AAA's largest moose taken in '99 and is still the biggest spread moose taken by AAA. It was taken in the Dog Salmon area on the Alaska Peninsula. Eric's guide was Willis Thayer. This is the cover of our annual newsletter. We featured three of our largest animals on the cover. The cross-hairs always had our largest bear and ram in the center. AAA is best known for taking big brown bears (10’+) and in past years B &C caribou. We also had a good reputation for really nice sheep. When it came to moose we always tried to get our clients at least a 60 incher and for many years we had an over 60” average. Our areas just didn’t have the genes that produced the monster bulls that were in some of the more northern and southeastern areas. But all three of our areas had some dandy bull moose. Greg Hedgis, OH, and me with his 64" moose taken in the Wrangell Mountains in '87. Rick Hubble, UT, with his 64 incher taken in the Wrangell's. This was AAA's largest moose taken in '94. Starting out in our first area in the Wrangell’s, we only took one or possibly two moose hunters a season which were mixed bag or combo hunts. There were many years that we didn’t take any moose hunters at all. In a normal season we would only see two or three bulls total so only harvesting one every year or so was as good as we could do. Our largest taken was a 64 incher. We took two of those over the years. The second 64” was taken in ‘94 and was AAA’s overall largest that year. Our next biggest in that area was a 62 ½ incher and the rest were 60” or under. Craig Hoskin, AZ, with his 73" moose. This was the largest moose taken in '97 and was taken in Western Alaska. His guide was Sagen Juliussen. The packers called this pack, "the pack from hell." A mile and a half in a swamp going up hill the whole way!! Between our other two areas it was normally a toss-up as to where the largest moose would come from. The Alaska Peninsula area holds the record spread of 73 7/8 inches. The Western Alaska area comes in a close second at 73 inches. Brent would take four or five moose hunters on the Peninsula each season and their best average was 65 3/8 inches in 1988. Their largest that year was a 69 incher. My camp in Western Alaska would take six moose hunters a season and in ’97 we had a 66” average with the largest spread being 73 inches. That was AAA’s largest average size in any area. I will have to say that the Alaska Peninsula area took a few more bulls over the 68 inch class. As you can see from the pictures, all of our guides were very competitive, always trying to get their client the largest trophy in their area. These photos are some of our largest moose. Gen. Marvin Fuller, KS, with our largest scoring B&C moose. It scored 243 3/8 B&C points with a 67 1/2" spread. It was taken in '88 on the Alaska Peninsula. Matt Caldwell, IL, with his 69" spread moose taken on the Alaska Peninsula in '88. 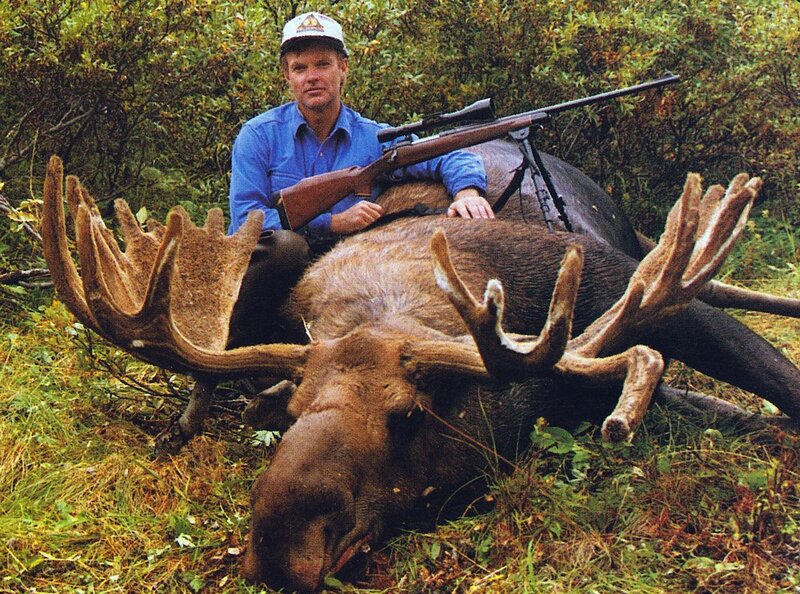 Dave Redding, PA, with his 67 3/4" spread moose taken on the Alaska Peninsula in '89. Bob Rhodes, OH, with his 67" spread moose taken in Western Alaska in '89. Taylor Mills, NJ, with his 64 1/2" spread B&C moose. It scored 226 B&C points and was the first moose in Western Alaska to make the record book. It was taken in '91. (R to L) Roy Joblonski, NJ, and guide Brent Hudson with Roy's 71 1/2" spread moose that he took with his pistol. It was taken in '92 on the Alaska Peninsula. John Lowe, PA, with his 68 1/4" spread moose taken in Western Alaska in '93. Jerry Moore, WV, with his 65 incher taken in Western Alaska in '93. Check out the white nose. Marty Johnson, AZ, with his 65" moose taken in Western Alaska in '95. Donald Sablinsky, PA, with his 68" moose taken on the Alaska Peninsula in 2000. Gregg Scherr, SD, with his 68 1/2" moose taken on the Alaska Peninsula in '96. (L to R) Guide Dennis Byrne, Chris Parrack, TX, and me with Chris's 68 incher taken in Western Alaska in '99. The moose was taken right behind base camp. Chris Hornak, PA, with his 69 1/2 incher taken in '08 on the Alaska Peninsula. It scored 236 B&C points. This was after I retired but it was such a nice moose I wanted everyone to see it.